The D2 PHASER is the fastest and most compact all-in-one onsite crystalline phase analyser available on the market. The price / performance leader for powder XRD is ideally suited for onsite quality and production control. 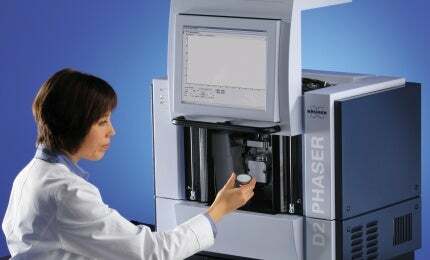 The D2 PHASER desktop diffractometer is equipped with an integrated PC and a flat screen monitor. It is mobile and easy to install with only the need for standard electrical power. The D2 PHASER is therefore ideal for laboratory or on-location operation, in other words, it is a true Plug’n Analyse system. Top-of-the-range, award-winning software is available for unravelling your minerals’ secrets. The DIFFRAC.SUITE software provides a common look and feel for measurement and analysis software. Powerful tools provide information on the phase content, the phase composition, crystallinity or crystallite size. In combination with the ICDD powder diffraction file, the freely available COD or with a user database, semi-quantitative phase analysis and combined XRD-XRF are available.